HELP!!! I got my most recent fix yesterday and am definitely going to need some advice on this one. 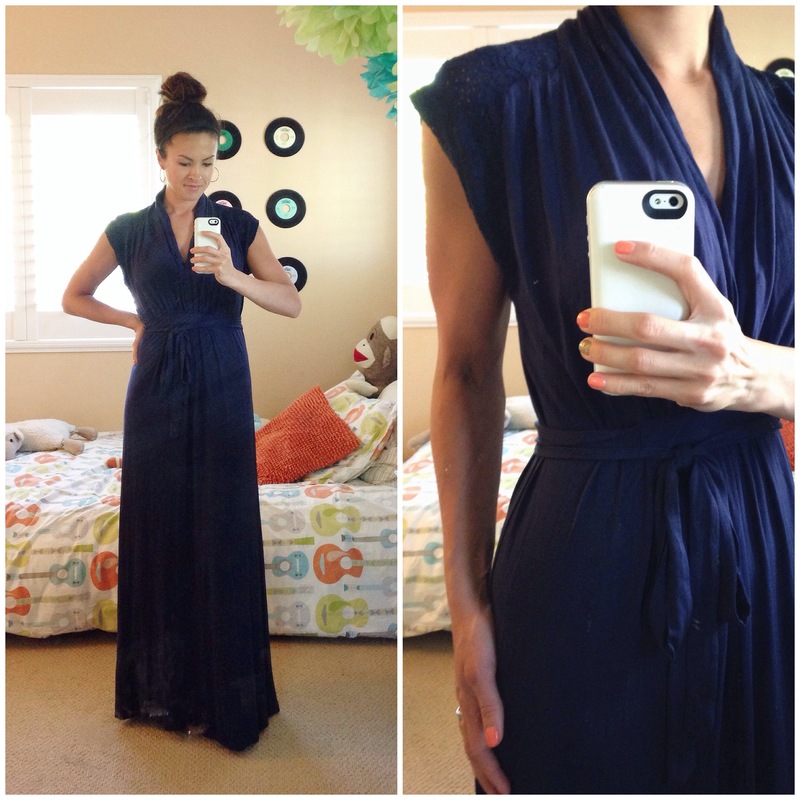 If you saw my last Stitch Fix review it was a total slam dunk! Tried everything on, took the tags off, and hung them all up in the closet…no questions asked. If you’re new to Stitch Fix you can read my first review that explains how this awesome company works and if you are still hanging by the sidelines and are finally convinced to schedule a fix then head over and create your super fun StyleProfile first. Ok back to this fix. I’m torn. I definitely know which two items I want to keep and the other three I like, but I’m not sure I love. Although, if I keep all the items the price almost works out to be the same with the discount, as it would be to just to keep the two! I have to send everything back tomorrow if that’s what I decide to do, so ready, set, go and help a mama out! I love this top. The only thing that is a little weird is the entire fold part is open. I don’t know if it is supposed to be stitched somewhere to hold it together and it ripped, or if that’s actually how it’s supposed to be. It would definitely need a little cami underneath or some fashion tape, but aside from that I think this top is great. I’m just not fully convinced on this one. I love the zipper detail on the back and the colors are fun, but I saw another blogger say theirs reminded them of a running shirt and now I can’t get that out of my head. It’s $64 too and I’m not totally in love with it. But like I said above if I keep everything and get the discount I would be getting this top free essentially. I really wish they didn’t describe this shirt as chevron. I just don’t want anymore chevron in my life! I’m thinking that the “abstract” part to it is enough to make it a subtle chevron though and I am liking the colors and fabric for the summer. Hi-Lo tanks are my favorite too. This one has me stumped…thoughts? When I first saw this in the box and saw the tag I was like, I don’t need an $88.00 maxi dress, you can find them everywhere. But after I tried this on my mind changed. The fabric is awesome, I love the tie waist, it has the best lace detail on the shoulders and around the back, and kind of has this high neck collar to it which I thought was really unique. I don’t think this photo does it justice, but I think if I sent this dress back I would always think about it. So for that reason it’s a keeper! So that’s where I stand…I know it’s last minute on a Friday evening but if you have a second please share your thoughts. I can make up my mind on my own for a lot of things but clothing is not one of them! I’m excited for another Stitch Fix slam dunk, but I was definitely happy with my June delivery even if I end up sending some back! Have a great weekend everyone!! 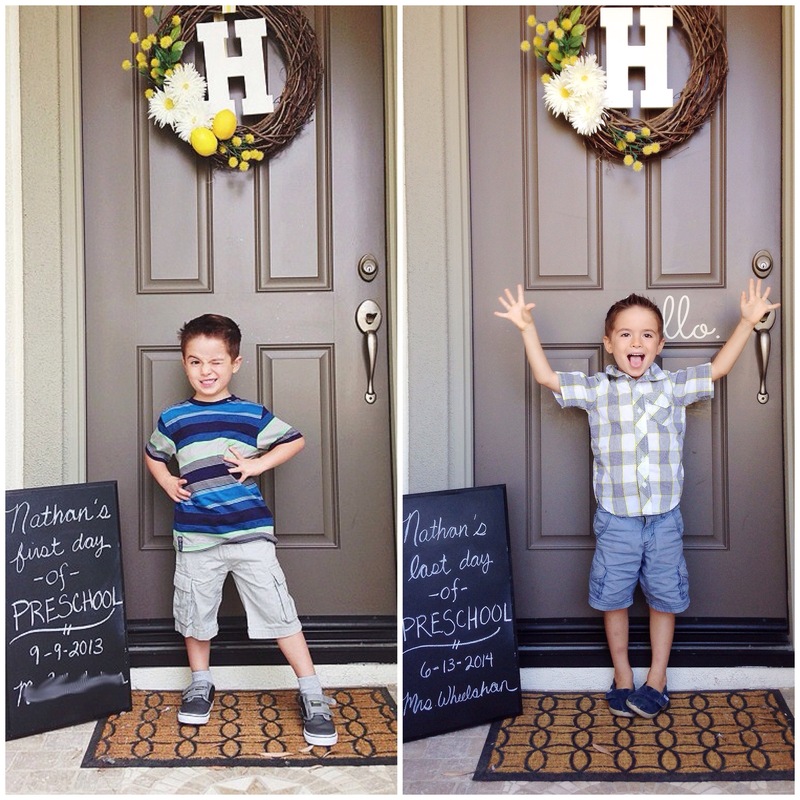 Oh and side note…..SCHOOL’S OUT FOR SUMMER!!! Stay tuned for our sunny So Cal adventures with the boys! 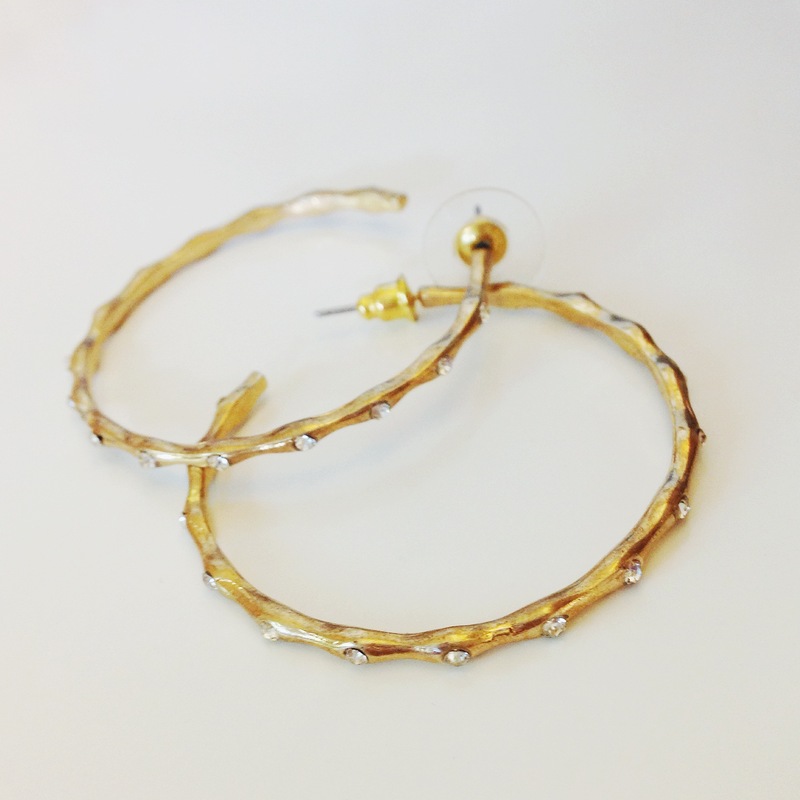 Keep the hoop earrings! I love them! The two shirts you are unsure of, I don’t love them either. The blue one is gorgeous in the back but the front is not as flattering as it could be. I totally agree that I love the back of that shirt but not the front. It went back!! Thank you for your advice I seriously needed major help this time! I love these posts! I say keep only the things you love. The blue tank is boxy and you have too nice of a figure for that! The “chevron” tank you can skip–don’t worry, they will send you more $50+ tank tops and shirts so you’re not missing out! You are right…it’s like I feel like I should keep things just because they got delivered to me, but if I don’t LOVE them why bother especially when it’s so easy to return them. I did only keep the things I love…the first shirt and the dress! Thanks for your advice! No to the tops- life is too short to have clothes you don’t LOVE!! You’re right Saz…I didn’t keep the shirts since I didn’t love them! My older earrings I think they just got old and tarnished because I wore them so often. I didn’t keep them though because of them being broken and I just don’t know how practical hoops are with boys. They would get ripped out immediately by them haha. #2 is my fav then #3…. Earrings = no. #1 is super cute too!!!!! I should have given you my #2 & #3 since I didn’t end up keeping them hahahah. OMGOSH I JUST SAW THIS! YES YOU SHOULD HAVE!! ARGH…. LET ME KNOW ON YOUR NEXT FIX THE ONES YOU DON’T KEEP MY NEXT ONE COMES TUESDAY!!!! I’m living vicariously through you right now! I totally love the two you are keeping and share your feelings about the other three items. The earrings are great, but the fact they came broken would give me pause as well. Will the next pair break too soon? I really dig the color block blouse, I actually like the sportiness of it and the colors are super fun. 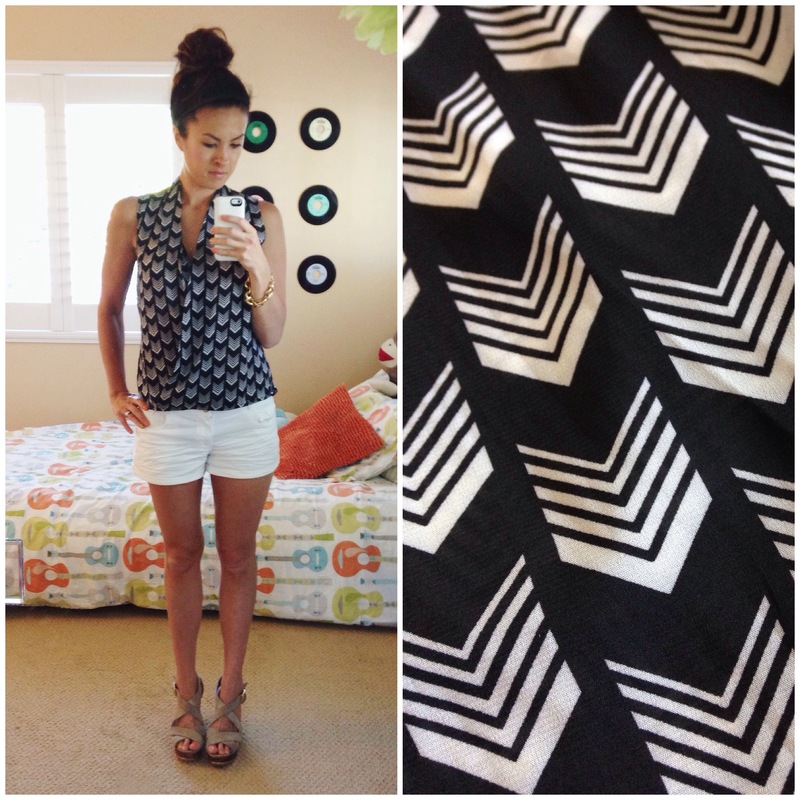 The abstract chevron top is also very fun. That being said, I think you should stick with the two faves and let the others go. Plenty of more clothes to fall in love with! Thanks Abby!! You know the earrings were actually just like the ones Kelly Hunter made and gave to me after high school. I think that’s why I liked them so much, but hoops just aren’t practical anymore with the boys grabbing at me all the time ha. I ended up just keeping the first shirt and dress…you are right, more clothes to come! No to the running shirt, no to the purple high LO chevron and no to the earrings. Black and white shirt and the dress are awesome. If you’re unsure of the rest go with your gut. 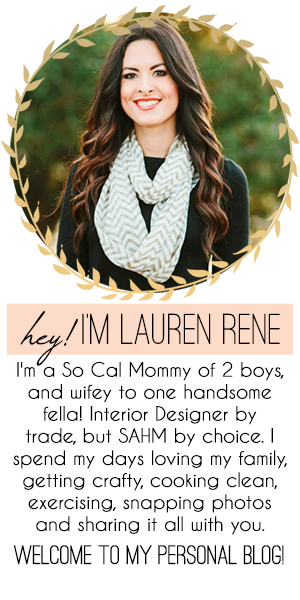 Hey Lauren! The dress and the first top are both lovely pieces but if you can get all 5 pieces for about the same as the two you are keeping then WHY NOT?! I’m not crazy about the tank with the zipper in the back but it looks really cute on you and it could transition into other seasons with a jacket. Actually, I think all the pieces transition well into the fall. So, if I were you I’d keep them all since it’s the same as the TWO pieces you know you want. I personally am unsure on the maxi dress but I’d hate for you to pass and then day dream about it every time you go to wear a dress! I want to try Stitch Fix but I’m not sure it works with our budget right now. Hopefully, one day! Well after I did the math it was actually $70 more to keep everything…and it just didn’t seem worth it since I didn’t love those other items. I hope you get to try stitch fix sometime too. If you refer your friends you get a $25 credit so if you can get them to add up you could get yourself some free clothing which every girl deserves! I know I am totally late – and you probably decided already but I think that everything is cute. . . and while I agree that you should only keep things that you LOVE – sometimes with Stitch Fix, it is totally worth it to keep everything to get the discount, so If I were you, I would keep everything with this fix. You know Katie it actually ended up being $70 more to keep everything. I just didn’t go for it since I wasn’t in love with the two other shirts. You are right though the keep all discount is always very tempting and totally worth it! Okay I have the same question as someone else (though I may be too late regardless)… if you can get them all for the same price as the two you love, go for it. With that said: I actually like the earrings but hopefully the quality is not poor (which made them break easily?). The zipper back short confuses me a bit – I love the idea of it but not sure how it falls in the front is the greatest thing but I know you can make it look amazing if you kept it. Love these posts! Oh and I finally scheduled a fix for July! Eeks. OMG I am so excited to hear about your first fix!! How can I see what you get?? You will have to find a way to show me. E-mail?? Are you on FB?? I actually ended up just keeping the first shirt and the dress….I would have ended up spending $70 more to keep everything after all and it didn’t see worth it since I didn’t love them. And you are too sweet…definitely don’t think I have lost anymore inches, trying to actually gain more muscle haha, but thank you! Hope you had a great weekend mama! You better believe I will email pictures to you. I’m going to be so nervous to spend more than $12 on any article of clothing so I will need all of the help and advice I can get. The only downside to something like Stitch Fix is that it doesn’t come with a personal consultant IN the box who tells you what you flatters you (or doesn’t!). That’s where friends (you!) come in. Mid-July, be on the lookout. Oh and no Facebook for me (only for my business but it’s purely business and I can’t even follow friends or anything, which I prefer). The only person on the planet, right? I hope i’m not too late leaving my 2 cents! I say keep top #3 but return the other top and the earrings. I like everything on you but that top does remind me of a running tank and since you said it, I can’t get it out of my head either! Hahaha right? I seriously can only think of running top…picture it with some lulu shorts and running shoes and it would totally be cute lol. I actually just kept the first shirt and dress….I have too many expensive habits lately and really need to just pick the things I LOVE. You treat yourself tuesday posts are getting me in trouble ha! Hi Jenn…they are actually last year Steve Madden. I JUST bought the Bevrlie wedges from Steve Madden yesterday and love them equally so maybe look into those as well! Good luck in your search for the perfect pair of tan wedges!